It's been a busy couple of weeks on the Klingle Valley Trail! Stream restoration and retaining wall construction are underway, gas line relocation work continues, and the east entrance to the jobsite is now open for construction traffic. After two weeks of site preparation and materials deliveries, the stream restoration contractor started work on Segments 2 and 3, shown on the image below. Stream restoration construction is difficult work. The contractor has to dam up the upstream side of the creek and divert the water flow using a pump and hose system. Once the work area is sufficiently dry, the contractor then excavates the stream bed to provide a stable foundation for the restoration features. 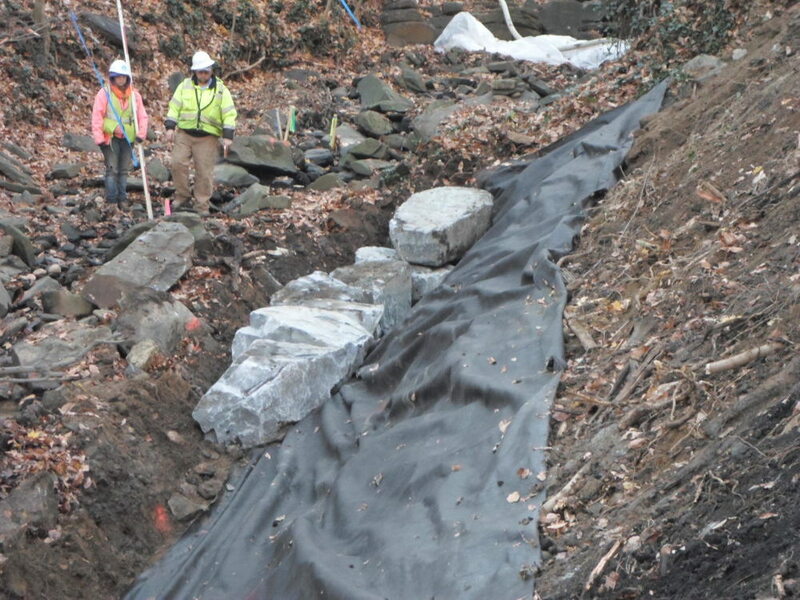 In this case, the contractor installed a Stone Toe, which consists of stacked boulders that will prevent future erosion along the stream banks. The stones come from the quarry roughly cut into block shape (called "imbricated riprap"), and must be placed at precise locations and elevations based on the design stream channel levels. The contractor establishes the diversion dam and pump around system to start stream work. Stone placement is measured to precise locations and elevations specified in the plans. Riprap for Stone Toe construction can be as heavy as one ton, so heavy equipment is needed. Stone Toe coming together. The geotextile behind the stone prevents the stone from being undermined and washed out in the future. Additional stream restoration site preparation activities took place last week, including access point grading and tree removals. Some of the trees that were removed to accommodate the new stream channel were saved with root wads in tact to be reused in the restored stream. The root structure when placed in the stream creates new habitat for aquatic life. The prime contractor started work on the first new retaining wall on the project. The wall is near the west end of the trail just behind the Woodley Park Towers building. The wall replaces a stone masonry wall that collapsed many years ago. The wall will serve as one of the banks of Klingle Creek, so the contractor had to take similar steps to dewater the area each day using pumps. With all pump-around activity on the project, the pumps must be turned off by 7 PM to minimize noise disturbance. The concrete foundation for the retaining wall was installed on Monday, November 23rd. The project inspector performs concrete acceptance tests before it can be placed. Tests include temperature, consistency (pictured, also known as slump), and air content. Samples of the concrete are taken in plastic cylinder molds, cured overnight, and taken to DDOT's QA/QC lab for strength testing at 28 days. The contractor placed thermal blankets over the foundation after placement. Inspectors checked curing temperatures throughout the week to ensure that the concrete temperature doesn't drop below acceptable limits. To maintain the historic character of Klingle Road, the project will reuse much of the existing stone from the area. 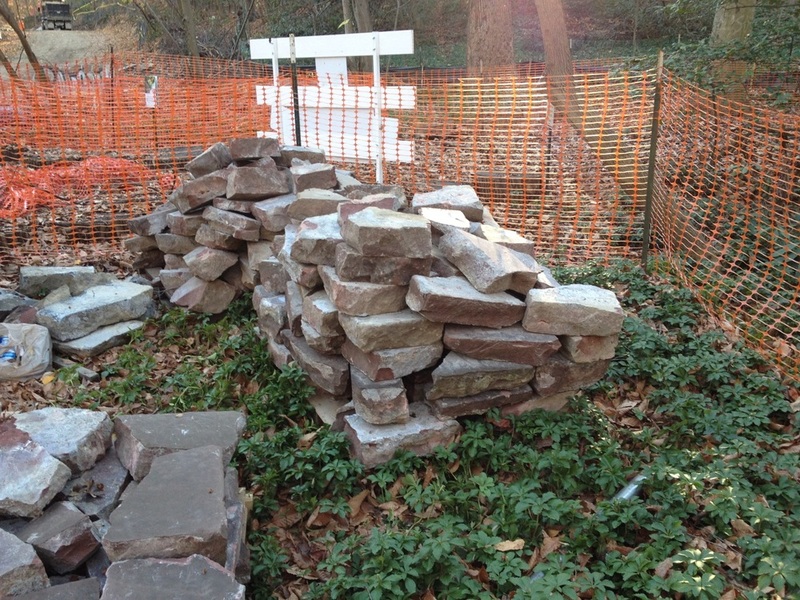 For the retaining wall, we are salvaging stone from the existing stone walls that collapsed into the creek. The contractor also stabilized the east entrance of the job site, near the Porter Street interchange. The east entrance is now accessible to construction traffic and will prevent any backups at the west entrance, where Washington Gas continues to work along both Klingle Road and Cortland Place. Look for a new retaining wall to be built along this slope in 2016. 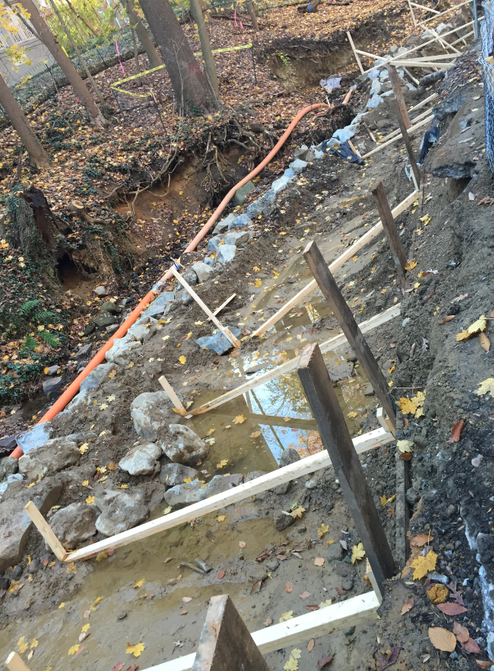 The contractor placed temporary riprap along the slope to stabilize the construction entrance. Aggregate base installed to provide a riding surface. Concrete was later installed at the edge to prevent the base from washing into Klingle Creek. Silt fence installed along the edge of the stabilized roadway as an erosion and sedimentation control measure. Washington Gas continues its work on the west end of the project. Phase 1 is nearly complete, with 300 feet of pipe left to be installed, and Phase 4 continues along Cortland Place towards Devonshire Place.